You can create a Tumblr to use for your inbound marketing efforts in only seven easy steps. Here's how. 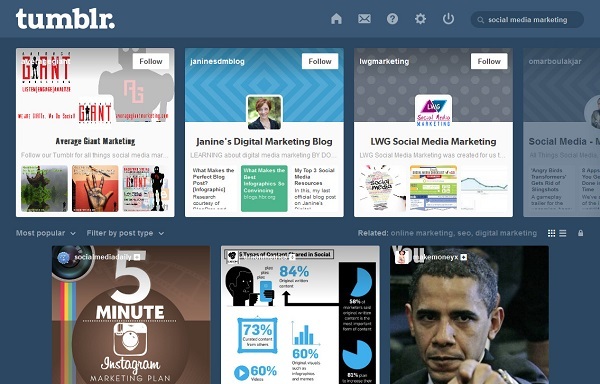 Tumblr is best described as a social networking site, blogging platform and content curator rolled into one. Although it's not as popular as Facebook or Twitter, it is a formidable social media marketing tool in its own right. But before we delve into more details regarding that, let's analyze what it takes to make a Tumblr-based campaign successful. 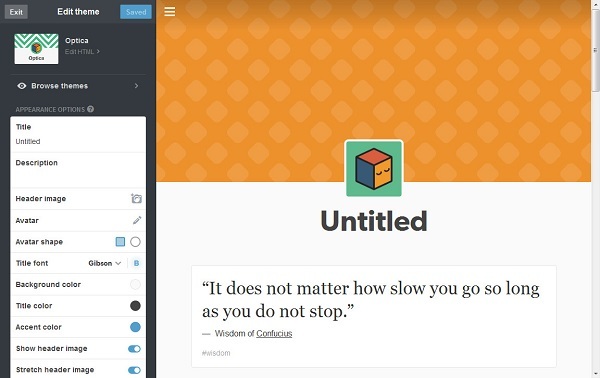 How should businesses use Tumblr? Considering the ever-changing tastes of Tumblr's demographic, it's important to adopt a cross-platform strategy if you want to utilize the site. In other words, your Tumblr blog should complement, rather than carry the entire weight of, the rest of your marketing campaign. The top global brands seem to understand this, since as late as 2013, only 31 out of 100 of them have actually used the site. That said, there are businesses that work well with Tumblr's emphasis on visually appealing content. Web designers, graphic artists, and even animators have been known to use the site to show off their skills and land paying jobs. What do Tumblr users look like? Currently, Tumblr is the world's sixth largest social networking site in terms of active users. As of 2013, 46 percent of them are between the ages of 18 and 24—a rather hard-to-reach demographic. But because Tumblr makes it easier to create and share multimedia posts compared to other social networking sites, those same hard-to-reach users spend more time on the site than on the likes of Pinterest, Twitter, and Linkedin. Also, it seems that 92 percent of users access Tumblr via desktop PCs. However, a growing number of them are using smartphones and tablets to do the same, indicating high mobile engagement on the site. 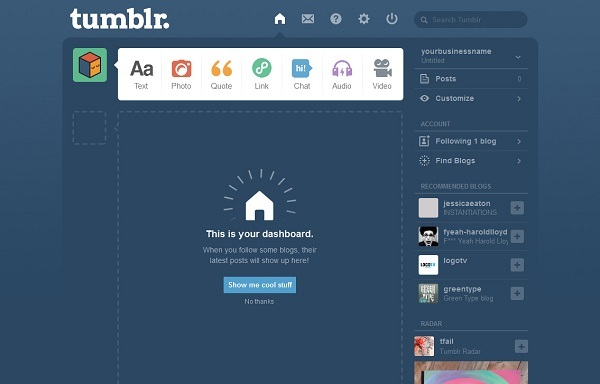 Here's how to start using Tumblr for your marketing. Whether you're confident that Tumblr is a fit for your business, or you simply want to try out the site to see how it works, here's a step-by-step guide to get you going. The best username is the name of your business, plain and simple. You can choose to have the ".tumblr.com" appended to your name, or you can set up a custom domain using the steps outlined here. If you're going to do the latter, remember to do it before you proceed to the next step, which is registration. 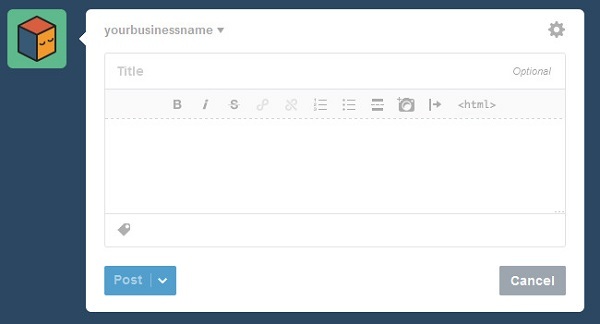 Go to the Tumblr home page, and enter your e-mail address, password, and username in the space provided. After you've completed the steps as prompted by the system, log in to your e-mail account, and click the confirmation link sent by Tumblr Support. Click "Continue to Tumblr" to proceed to your dashboard, as shown below. If you open your blog in another tab, you'll notice that it already has a default layout. In case you're not satisfied with it, click "Customize" on your dashboard to open this page. Keep in mind that no matter what you do with your blog, every element should reflect on your brand in a positive manner. To know more about designing websites in general, read these articles on the psychology of web design and the principles of effective web design, or hire a good web designer to do the job for you. 4. Make your first post. Here, you can format and link text, insert images, create lists and cut longer posts using the "Read more" function if you wish. You can keep abreast of the latest developments in your industry—as well as keep tabs on your competitors—with Tumblr's search function. Just type any keyword in the "Search" bar located on the top right corner of your screen, and you'll be flooded with blogs like the ones shown below. If you "Follow" the ones that look most promising, their latest posts will automatically show up on your dashboard. Another way to always be "in the know" is to use the "Track Tags" function. Click any tag—the light gray words with the "#"—at the bottom of any post in your dashboard, and you'll open a page where all the posts with that tag will show up. Then, click "Track this tag" to be alerted every time a new post with that tag appears. 6. Start reblogging and liking content. If there's one thing that makes Tumblr particularly powerful, it's the "Reblog" function. 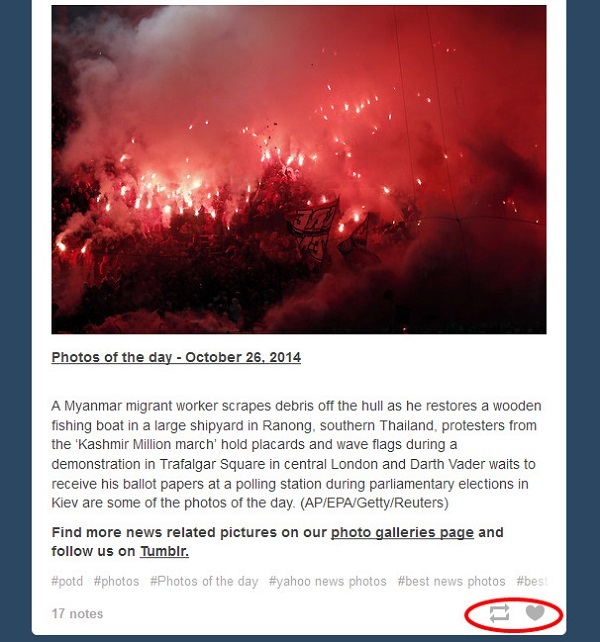 Similar to Twitter's "Retweet,” Tumblr's "Reblog" allows you to share someone else's content on your own feed. Unlike retweets, though, reblogs offer more value for everyone, since it allows users to leave notes on a post and let their voices be heard, without getting drowned out by others. The possibilities of Tumblr are as endless as scrolling on your dashboard. Once you get a good feel for the site, it may be just the thing to get your online marketing campaign back on track.